Because I celebrated my 61st last month, I'm thinking of things that I hope will endure. Health, abiding love and life in a place of peace is all I could hope for, and more. And there are also a few objects I would like to invite along, standbys that continue to provide joy and comfort. 1. 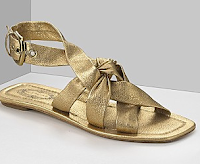 Metallic sandals or shoes. They dress up the simplest clothes, go with anything, and pack easily. 2. A statement necklace that says, "I enjoy life". Statement for on e woman is a Tahitian pearl pendant, for another, a lavish string of lapis discs. Make it real; real stones have 'zat', a term originally applied to the life in fine turquoise, a quality that can't be photographed, but is as evocative as fog caressing a riverbank. 3. A black lace bra: you will know, if no one else. 4. A fragrance that gently but persistently whispers I'm here! 5. A well-cut soft sweater. Keeps you cozy, looks luxurious, wears well. And you can wash it yourself. 6. A watch. This may be the generational ma rker; the phone or BlackBerry will tell you the time; the watch reminds you what you want to do with it. Fashion cycles inexorably repeat: platforms, round glasses, leggings: hello again? The latest fad no longer incites skittering desire. If people think, "Oh, her: shawls, pearls, black jersey", that's fine. I'll try to keep proportions current, attend to grooming, and not do too many little-old-lady-in-training things like scrabble in my purse for a stim-u-dent. What are your enduring favourites? I think all six are wonderful. I'd add earrings--diamond studs or some classic hoops. And a well-made handbag that goes with everything. By the way, thanks for your lovely comments on my blog. Toronto is on my short list, so I'll take you up on the shawls someday! I'm down with all of those. I might change out the watch for a cuff and the metallic shoes for red. Or I might just add them to the list! Along with a great pair of low-heeled riding-style boots, a red trench coat, and the perfect denim jacket. Nancy: Earrings of course; please start saving your air miles. StyleSpy: Mmmm. Red does add a kick! Pseu: These are great picks too. I wear the Hermes Cape Cod that's shown. And always wishing for a great bag! I've been wanting the Cape Cod watch for some time and it seems more classic the older I get, which is a good sign. I think it will become a "must" for this coming year. Otherwise I think all your choices are great and happy belated birthday. Happy birthday once again! Last night, we celebrated a friend's 61st. Now, neither my friend nor I could even dream of owning a Hermès watch unless we stole it, and that is definitely not worth doing hard time for (sorry for the dreadful pun). I think finding one's personal style and eschewing fads is possible even for those of us who can't afford expensive watches. Earrings, always, in silver or gold. As for the necklace, I have a real, roughcut turquoise necklace but never wear it. The person who gave it to me thought it would bring out my (turquoise) eyes, but it does the opposite, and the nice chunks are too massive somehow. I'm thinking of restringing it with some smaller silver beads and some other semi-precious stone to make the turquoise a bit more subtle. There is a bit of brown in the turquoise so perhaps something brownish. Since I ride my granny bicycle most of the year, leggings are not a fad item but an essential in chilly weather - under skirts, of course. I don't even like leggings worn as trousers on young girls, or on anyone not dancing, performing circus acts or working out. Oh, I do love red. lagatta: My Cape Cod is silver and cost about $1500 maybe 8-9 years ago. Not an arm and a leg considering I wear it daily. Turquoise mixed with silver would be great, also looks smart with amethyst (coral makes it brighter whi I'm guessing you don't want). Pearl is beautiful with turquoise too. Whatever you do, so hope you can find a way to wear those beautiful chunks! Yes, I've been going through all my drawers and jewellery boxes during the slow summer time, doing triage between what to keep - and perhaps rejig - what to donate and what to throw away. (Pity that there is no recycling here for worn-out natural fibre garments). I also have a coral necklace, too close-fitting for my tastes, but it is the natural-shaped coral and would not work with the chunks of turquoise. It will also be restrung. No, of course your watch was a wise purchase and not at all an extravagance, but my friend and I probably don't net much more monthly income than that. This is the case for many people working in the arts, and I work in community groups with people who earn far less, so I wasn't saying that either to whinge or out of envy. People should by quality goods if they can afford them; it is a saving in the long run. Great boots -- right now my Fiorentini & Baker flat boots -- funky, classic, timeless, and wearable into the foreseeable future. A clean-lined, functional, but distinctive bag -- no logo ever. The silver First Nations carved cuff my husband gave me fifteen or so years ago, worn almost daily. Like Lagatta, I have to find my style-setting pieces on a budget somewhere below the Hermes watch (although I agree that it's well worth saving for and pays back very well). With a good eye, bags can be found that do the trick for me at $3-500, and ditto for boots at $5-800 and jewelry from $400 upwards. And with our maturity we've learned the pleasures of delayed gratification, right? Mmm. Duchesse, you are my source for jewelry shopping. Sometime, I'm going to have to cull through your posts and bookmark your vendors. Your chain necklace keeps resonating with me, too. Are you a David Yurman fan? Fairly common, but more affordable than Hermes! Happy birthday from me too Duchesse ! I nod a yes to all your choices. I have been cutting down my jewelry with a rough hand lately; have exchanged and invested, so now I have a pair of 1.5c E white gold diamond studs. I got so excited, when you told about your friend, who has only a handful of jewelry. The cashmere knits are wonderful. At this point I only long for a nice pair of ankle booties with a moderate heel. Can´t find a nice pair anywhere. Thanks for introducing me to "zat," a term I'd never encountered. I'm now busily researching the word--if it becomes a Word of the Week, I'll be sure to credit you! If you scrabble in your purse and come up with a bunch of dinner rolls, you've definitely turned into my grandmother from 30 years ago. metscan: Would you like to write a guest post on how you turned your items into 1.5ct E studs? I'm serious (and admiring)! Or comment again, we are interested. Fritinancy: This might be a native American (Navajo?) world, I ran across it many years ago reading about turquoise. Word of the Week, ME? lagatta: My jewellers have a very long term and flexible layaway plan. They have even offered to let me take an item before I pay fully, but I just can't do that. 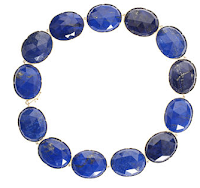 dana: I'm not a David Yurman fan, I have occasionally admired a piece on someone else, but there are so many copies out there- this has put me off it. What do you think of it, dana and others? WendyB: I will admit to taking those little shampoos and soaps in the hotel room bath if they are nice- but so far leave dinner rolls and ketchup packets alone. Okay, I´ll comment the way I´m able to. First of all the jeweler, I bought these earrings from, is a family friend of mine. Secondly, I inherited a small sum after my mother passed away. Thirdly, I try to follow the `rule´: Buy the best you can afford. My jeweler told me some time ago, that he had in his possession a diamond 1.61 c River E ( bought in1975 ) and that he had got hold of a similar one 1.51, and asked me if I was interested. Naturally I was. In exchange I gave him my 0.7c ones and a pair of earrings of way lesser value, I had previously bought from him. Well, I still had to put quite a sum of cash to meet his fair offer. For quite some time now, I have been reducing my jewelry. Some of it I gave to my daughters and some of it has been sold. So really now I am in the situation, where I do have very little jewelry, something I have been aiming for a long time. I have a very nice pair of diamond studs( with certificates) and I´m so pleased. This size fits properly, no need to go larger. What do you think? matscan: Thanks for the details! A bequest to get you started, a solid relationship with your jeweller and confidence in your taste have resulted in a choice that delights you. Hope your story inspires all of us to wait, save and weigh options, regardless of material or size. Well, I'm "only" 39 but your blog speaks to me more than almost any other. When it comes to possessions, it seems as though my teens & early 20s were about longing. My late 20s & early 30s were about acquiring. Now, I've moved into culling & editing. Too much stuff! So little of which looks or feels "right" on me, and which serves only to clutter my mind & closet. - I had a Cartier Tank and *gulp* lost it. Whatever watch I buy next MUST be waterproof, since removing for swimming & bathing = recipe for absent-minded me losing it. Also, prefer to have date on the watch face. Any suggestions? s.: You and other younger readers are welcome! I like your 'musts' too. Had the same wish at one time and bought a Rolex Oyster, never had to worry where I wore it. Still runs, 31 years later! Your post sent me, chunky turquoise necklace and delicate coral necklace on a quest for new friends. Found a place very close to my house with a decent selection of semi-precious stones (bead quality, not setting quality), silver beads and fittings. It was full of craftsers, and alas a few of them were wearing crafty jewellery of dubious taste. Oh well, at least my fine-arts and literary studies are of some use. (They have had modest professional use too, of course, little-valued though arts are). s., I pretty much agree on your colour palette but I really need some purples/violets (yes, I know some are harsh and horrid), reds and foresty greens. And lots of Parisian leadpipe grey, which is so flattering and so hard to find. We all need those comfy but not hideous bras, but they are so bluidy expensive and the staff make you feel like a deformed bloated eel. A friend had the joy of being treated by mum to a fitting at the world-famous London corsetière Rigby and Peller: http://www.rigbyandpeller.com/ Looked like she had lost a good stone, in Brit terms. Enduring for me are watches - I think a gorgeous watch is a must. Good quality knee-high boots - I was fortunate 13 years ago to discover a Gucci warehouse moving sale and managed to snaffle a pair of knee high suede black boots for the princely sum of $95 (reduced from $1200) and they're still going strong. A great coat - these can last and if a heroine - be admired by many for years. A beautiful handbag - I have a wardrobe of them and alternate regularly, but having bought some of quality (including one from that Gucci sale 13 years ago) they last and last. Ooooh, you read my mind, chere Duchesse. I've been dreaming for years of buying a 2nd hand Rolex Oyster and with the bad economy, fingers crossed that some out of work bankers might be auctioning off theirs... where should I start looking, y'think? Another vote here for a Rolex Oyster; although watches are my favorite jewelry (and yes, I have my first Timex Brownie watch I got for my eighth birthday, and my Hamilton that I got for high school graduation), the Oyster is what goes on my wrist most days. Keeps fabulous time, and the date is under one of those magnifying bubbles on the crystal so these eyes can just about see it without the specs. lagatta: Did you make a choice? Will you string yourself? Rigby & Peller fit the Queen as well! Would like a bespoke bra one day (Alice Cadolle, Paris) to note the difference. For now I change them every 6-8 months and swear by one model, Olga's Sheer tapestry Minimizer. s: Van Rijk on Eglinton has a good selection of vintage watches. Try Toronto Antique Centre (276 King W.). Also, local auctions (Richie, Worthington). Check eBay too; enter style you want into search engine to research prices. Though there are reputable dealers, some sellers cannibalize parts so you get Rolex case but not works. Be sure to ask and look for a dealer with 100% feedback rating. Belva: Thanks for the second opinion! Mine is quite impervious to wear but did fall on it once and repair bill was more than I paid for it. There's an award for you over at my place -- it comes with an assignment (a meme, of course!). Don't feel obliged, but I'd love to see what you do with it if you choose. Happy Birthday! Love all the items on the list. Mine would add a Cartier Tank and maybe a pair of Louboutin black pumps. Funny how as we age, our tastes run to the classic (and not so cheap!). Did we always aspire to these but felt time was on our side so we could dawddle a bit with lesser quality? maggie: That's a provocative question and I'm going to think about and post on it! Thanks!